All submissions should be made online at the Policy & Politics Editorial Manager website: http://policypol.edmgr.com. New users should first create an account. 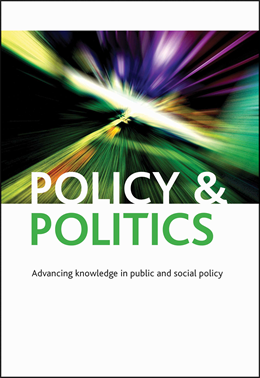 If you are interested in public policy and adjacent subjects, such as politics and social policy, we encourage you to either register at, or log in to, the Editorial Manager site and specify your areas of interest so that you can be invited to support the journal by reviewing articles relevant to your expertise. All submissions must include an abstract of not more than 100 words, up to four key words and be between 5,000 and 8,000 words in length (including references).Submissions must be completely anonymised and uploaded without preliminary details, such as title, author, affiliations, abstract or keywords in the submission file. All submissions will be subject to anonymous peer-review processes (unless stated otherwise) by referees currently working in the appropriate field. The editors aim to provide quick decisions and to ensure that submission to publication takes the minimum possible time; most papers can be published online via FastTrack ahead of print publication at: www.ingentaconnect.com/content/tpp/pap. For information on what is permissible use for different versions of your article please see our policy on self archiving and institutional repositories. If you are interesting in making your article available through Open Access, please see our Open Access options. Please read our ethical guidelines for authors, editors and reviewers. If you have queries regarding the submission process, please email the Policy & Politics office for assistance: pp-pp@bristol.ac.uk.